The Get Qualified series provides clear and concise guidance for people looking to work within the electrical industry. 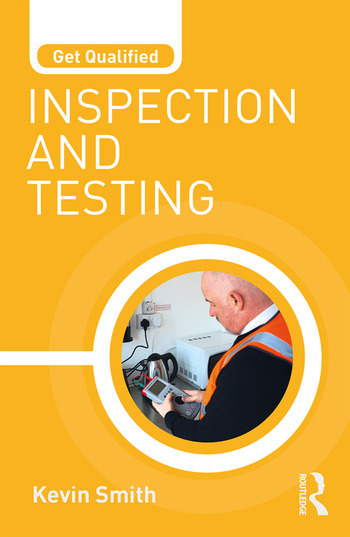 This book outlines why the inspection and testing of electrical installations is important, and what qualifications are required in order to test, inspect and certify. All you need to know about the subject of inspection is covered in detail, making this book the ideal guide for those who are new to the subject and experienced professionals alike. There are also sections on exam preparation, revision exercises and sample questions. Chapter 2: What is Inspection and Testing? Chapter 3: Who can carry out Inspection and Testing? Chapter 4: What are my Training Options? Kevin Smith is a highly experienced Electrical Trainer, who in 2006 started his own electrical training company which led him to deliver training courses for companies large and small throughout the UK. Since 2008 he has personally taught the 17th Edition IET Wiring Regulations to over 1000 electricians. Kevin is currently the Training Manager for Seaward, a Large UK based manufacturer of electrical test equipment. He is the author of Get Qualified: Portable Appliance Testing also published with Routledge.